As a 90's child in Houma, Louisiana, we would visit LUMCON on school field trips. I remember being charmed by the facility at a young age, a strange and seemingly out of place cement fortress at the end of the world, surrounded by wooden homes raised on stilts to protect them from rising waters. LUMCON has been the site of five Public Lab Barnraisings, in part because it exists at the very fringe of land and water off of the Louisiana coast, at the front lines of climate change in the United States. It's been about two decades since my first visit to LUMCON and the change in landscape is visceral and painful for me to acknowledge. This year's Barnraising brought together a diverse collection of knowledge - experts in their fields ranging from the Gulf coast to the Eastern seaboard, with representatives from the United Kingdom and China present to discuss the ways that we can continue to work collaboratively in order to better understand the environment and make scientific knowledge more accessible. 2017 has been an exciting year for Public Lab! In May we were joined by Bronwen Densmore as the Open Hardware Community Manager, and oversaw a move from our longtime home in Portland, Oregon to a new location in Providence, RI, where we were also joined by a new shipping and inventory coordinator, Amanda Snow (who you will meet in next month's newsletter). Read more about our year-end wrap up. Thank you for all you've given to the Public Lab community in 2017! 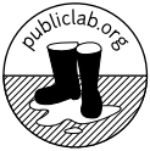 As we look toward December 31st, we have one final request-- please consider making a year end donation to the Public Lab nonprofit. Click below to make your tax-deductible donation now, and help us continue this wonderful momentum as we head into the new year! If you were at the 2017 Barnraising, you might have had a chance to see some of the progress that the team at Parts & Crafts has made on their Raspberry Pi microscope! We're really excited about seeing this project move forward, and expect that 2018 will be a big year for microscopy and particle analysis in Public Lab circles. Follow along (and contribute) in research notes. Q: You've joined our team in New Orleans- What connects you to your city? I originally came to New Orleans because the city (music, architecture and food especially) reminded me of my time in Senegal as a kid. What encouraged me to stay was the variety of people that call Louisiana home and their unique approach to confronting conflict; through art, creation and a culture of celebration. I think that New Orleans has a transformative and magical quality to it, and I think that the people here use that to adapt to conflict unlike anywhere or anyone else. Q: Speaking of conflict- your education is in Peace Studies. How did you become interested in exploring environmental issues? Peace and Environmental sustainability are two bound fates. In the study of Peace and Conflict, you learn that resources are often the center of dispute, so places that are resource abundant are often the theatre of violence and inequity. Sadly, the severity of climate change also means that no one in my generation can afford to ignore environmental issues. So what are your hobbies outside of Public Lab? My spare time lately has been split between my Pitbull, Wiwa, and my tremendous love of baking French pastries. 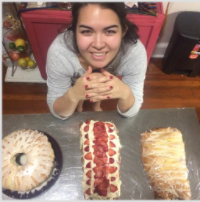 Luckily Wiwa also loves pastries, so she's my honorary sous chef! To contact Delany, email her at Delaney@publiclab.org.